CLEVER ACTING AT ST. MARY CRAY. A charming escape from reality was provided in the gentle sentiment and humour of “Marigold,” presented by the Temple Dramatic Society at St. Mary Cray Village Hall on Thursday last week and Saturday. This was the society’s twelfth production, and there was obviously sound experience behind the smooth-running presentation. Some of the cast created character convincingly, and the others were capable and knew their parts. Mr. F. Leslie Duck, the producer, is a man who knows his job thoroughly, and his wise guidance was evident continually, albeit not obtrusively. The scene is laid in Scotland ninety years ago, and the atmosphere compounded of strict religious observane, sound commonsense and salty humour, which is supposed to be typically Scottish, was put over very pleasingly. Those actors who essayed to speak the dialect did so well enough to deceive a mere Sassenach, but some shirked the attempt. Miss Ivy Duck, in the title role, was unfailingly delightful. Her picture of an appealingly innocent firl-woman who alternates between feminine wiles and hoydenish attitudes was well conceived and carried out with artistry. She made the accent add to the charm of her musical voice, and there was not a single jarring note in her performance. Miss Beckie Collier showed herself a character actress of intelligence and feeling in the sympathetic role of “Mrs. Pringle.” She tacked the dialect well, but this was insignificant beside her understanding interpretation of all the aspects of a motherly old lady. She can not only grasp the essential characteristics of a part, but can achieve the painstaking care necessary to make the audience realise them as keenly as she. Another conscientious actress was Miss Elsie Hook. She could not fail to impress herself on the audience, even though she appeard in only two acts out of four. There was a vivid realism about her portrayal of “Robina MacFarraline,” the Manse servant. Few amateur shows could produce better acting than her fit of indignation when another woman interfered in her kitchen. Natural acting ability is also evident in Mr. Maurice Jell, who was “Peter Gloag,” the divinity student. He can attune voice, gesture and face to incident with a sure instinct, and is a good eample of the stage virtue never dropping out of character. The stage managers were Messrs. N and W. Sampson. Mr. C. Fife arranged incidental music, Miss M. Grimes and Miss E. Hislop were programme sellers, and Messrs. C. Grimes, F. Murrells, R. Murrells, W. E. Webb and C. E. Vinson were stewards. TEMPLE DRAMATICS AT ST. MARY CRAY. The title, “an Arcadian comedy” saving all Scots readers, seems hardly right for a play set in the early forties against a background of kirks, elders, and animal diversions upon the Pelagian hersy. 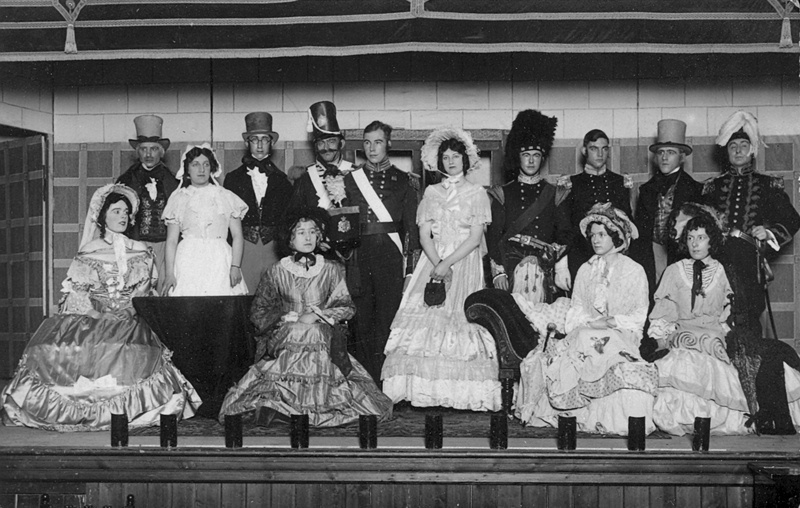 But “Marigold” (Allen Harker and F. R. Pryor), which was staged on Thursday and Saturday by the Temple Dramatic Society in St. Mary Cray Village Hall, is saved from belying its title by the intervention of no less expected a personage than Her Majesty Queen Victoria. Had the Queen never visited edinburgh, there would have been no celebrations; and had there been no celebrations, Marigold would have never had occasion to flee from rural Paradykes and the correct advances of the Laird of Kettinfoot to the more human and romantic arms of Archie Forsyth, of the Fifty-third Regiment, Light Infantry. As it turned out, nothing could have been more Arcadian, and the Temple Players, who were aiming to raise money for the Temple Congregational Church renovation fund, did very well with it. Miss Joy Duck was an artless Marigold, and spoke her lines in a manner for which “bewitching” is the most descriptive word. There were some which needed absolute innocence to be effective, and Miss Duck, either by design or accident, schewed any irritating coyness. An equally successful role was that of Mrs. Pringle, played by Miss Beckie Collier; in the first place she is to be congratulated on the most Doric accent of the evening, and in the second, on a clever interpretation of the pawky philosphy of this important character. As the Laird of Kettinfoot, James Payton, a good performance in character was given by Mr. Harold Hibbs, who suggested that he had a physical affinity with the back-board he advocated for his young bride. The clipped speech and the unbending carriage were quite effectively assumed. Major Andrew Sellar, a gentleman equally stiff but perhaps more fiery, was played by Mr. F. Duck, who was point device the military man. The leading man, opposite Marigold, was Mr. W. Eric Webbm who played Archie Forsyth. His portrayal of a dashing young officer fell neatly into place, and such was his success with the more romantic passages that there was nothing incongruous in the impending marriage with Marigold. Among the Scots accents—none of them, by the way, too improbable—the French of Madame Marley, played by Miss Dorothy Wood, naturally stood out more than usual in such cases. She made a grand and affecting figure of the actress, and a fitting mother to Marigold. Other successful roles were played by Miss Elsie Hook, as a flustered servant amusingly obsessed with the state of her “jeely”; Miss Cissie Betts and Miss Lizzie Blackstone as two maiden ladies, one starchy and one tender; Mr. Maurice Jell as the divinity student, Peter Gloag—another to add to his list of comedy successes; Mr. William Collier, as a rough-diamond soldier servant; and Messrs. Cyril Grimes, Will Algar and Edwin Vinson, as assorted and gallant soldiers. Mr. F. Leslie Duck is to be congratulated, with his actors, on a play that went through without a hitch; though it must be a pleasure to him to produce with such promising material. Messrs. W. and N. Sampson stage-managed efficiently, and Mr. C. Fife arranged suitable entr’acte music.